Events reach a peak in Yellow Tree Theatre. Photo by Justin Cox Photography. I was taken aback in the first part of Death of a Salesman at Yellow Tree Theatre when Willy Loman said he was sixty. I just turned sixty years’ old and I tried to convince myself I was not like Loman. He was, I told myself, the lead character in a play from the mid-twentieth century, not relevant to today’s society. But as the performances progressed in the intimate black box theatre, I conceded that Willy Loman is still the American middle-class Everyman. 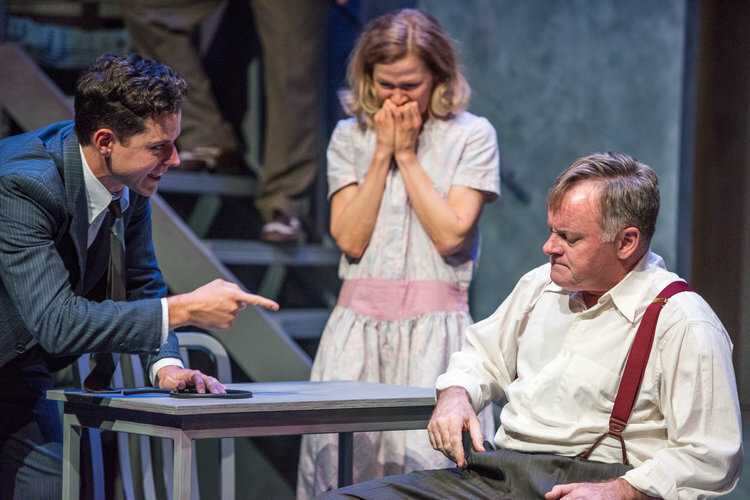 The play by Arthur Miller retains the power to comment on the false promise of the American Dream and the message is delivered very effectively in a solid production at Yellow Tree. Photo by Justin Cox Photography. Patrick Coyle gives an amazingly frenetic but coherent version of “the Salesman,” Willy Loman. As we watch his character escalate from self-pity to anxiety-ridden and then rage, we can clearly see the mental illness driving his behavior. In productions of earlier eras, these histrionics may have been interpreted simply as the “battle fatigue” suffered by an “on-the-road,” commission-dependent salesman. However, from the perspective of the present day, we can see the traces of his mental illness in the flashback scenes. The bravado he expresses when engaging his young sons definitely reveal an underlying depression. His conversations with his wife exude anxiousness and pressured speech. His tendency to idolize his older brother borders on delusional. An audience member can readily conclude that selling strictly on commission triggers his full-blown depression and even schizophrenia. Craig Johnson directes a highly-talented ensemble that comes across in classic 1950s-style Arthur Miller. However, changes in society and the economy in the last sixty years makes Willy Loman’s personal economic situation seem rather convoluted to the modern audience. Willy and the rest of American society during that era was driven by the belief that the workings of the free market system rightly determined the true worth of a man. In spite of all he had accomplished in raising his sons and contributing to the profits of the same company for over thirty years, Willy Loman ends up railing against being designated “a dime a dozen.” Today, we realize the economic situation of an individual can be significantly impacted by factors outside of their control such as corporate lay-offs, back-to-back recessions, and Wall Street scandals. Flashbacks showed the optimism a younger Willy instilled in his sons Biff and Happy concerning their ability to compete in the economic world. He especially pushed Biff to achieve things Willy thought were important for success. 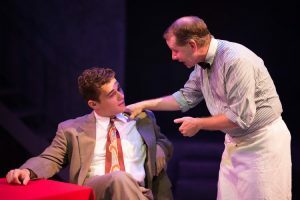 Jason Peterson as Biff and Damian Leverett as Happy effectively portray the emotional co-dependency of Willy Loman’s sons. They don’t understand what has happened to the father they idolized when they were growing up. Willy’s decline into existential confusion plays havoc with their own self-esteem. Laura Esping, as Linda, realistically portrays the long suffering wife whose consciousness has not yet been raised by the yet to come Women’s Liberation Movement. 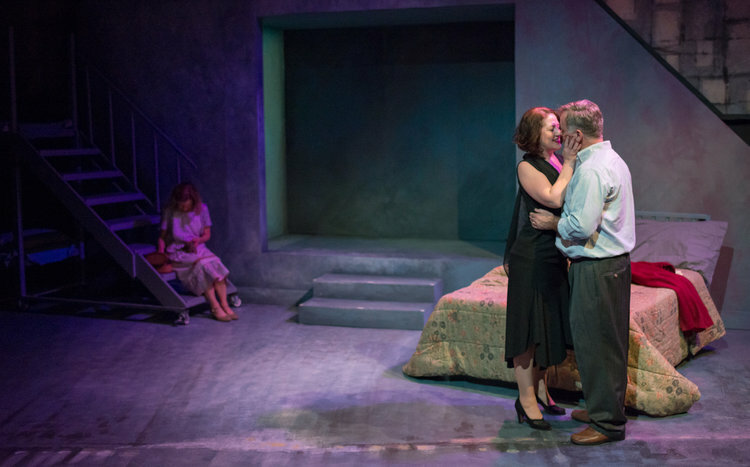 Her monologue near the play’s end is quite moving as she continually repeats “I don’t understand,” which really stands for the questions: why didn’t her boys mind their father, and why didn’t her husband feel he deserved to be with her? Michael Hoover’s set design is attractive in its minimalism. Yet, its triangular shape and seemingly concrete structure reminded me of the 1950s-style fallout shelters that people built during the height of the Cold War. The symbolism permeates the play’s scenes, as if it were placed in a time capsule, running continuously as its relevance diminishes and, yet, on some level is still meaningful to this sixty-year-old. Death of a Salesman plays through October 16 at Yellow Tree Theatre in Osseo, MN.